Monday July 1 was a day to See Red over the O’Farrell Government’s refusal to improve and extend ratios. 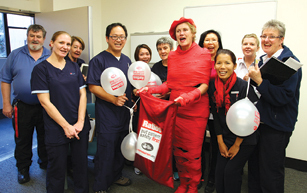 Nurses and midwives at state public hospitals and community health services wore red to work in protest at the government’s inaction. Nurses arrived for their shifts wearing red t-shirts, smocks, stockings, ribbons, armbands, lipstick – and even the occasional red turban. Union branches organised community rallies to collect petition signatures in support of improved ratios. Nurses attended a Community Cabinet meeting in Penrith wearing red. Nepean branch vice-president Kerry Rodgers criticised the government’s unequal treatment of hospitals, which she called “discrimination based on postcode” and urged Health Minister Jillian Skinner to listen to the views and experiences of nurses and midwives.